If you have the chance to go to Ireland in the off-season, do it. 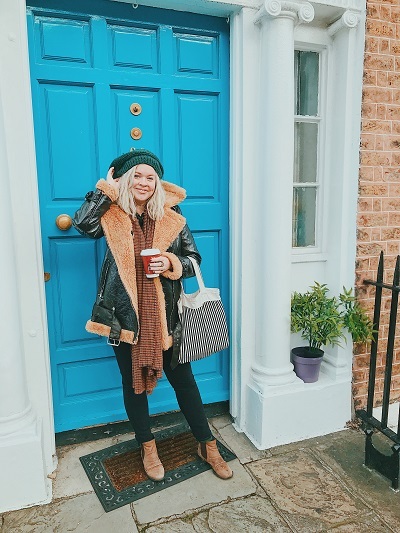 I’d never been and loved so much about my recent trip: the beautiful scenery, the kind people, the food and cocktails, the pubs – and going in early November. Alaska Airlines has a program called #worldwidewanderer, where they send people all over the world to experience a new city and share their journey along the way. I truly love traveling and seeing new parts of the world, so it was an honor to be able to take this trip and share my travels. 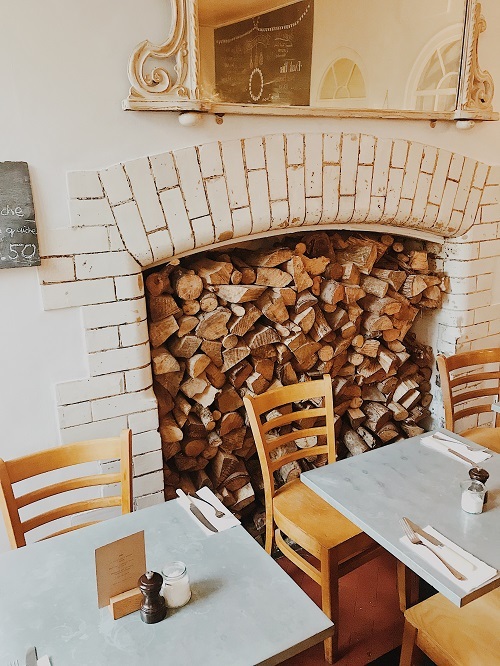 Bri Emory (@designlovefest) visited Ireland this November. My travel companion, Joanie, and I got to fly first class on Aer Lingus, which was a real treat! It felt like we started our Ireland experience as soon as we got on the plane in San Francisco, California. All of the staff was really friendly and served us scones, tea and delicious food. We were able to curl up in our seats, watch movies, drink wine and relax before hitting the ground running. Aer Lingus is also an Alaska Global Partner, which means you can earn miles as you travel! Once we landed, we decided to drive around the country, so we could experience as much as possible in four days. I am happy we did because we saw so much. 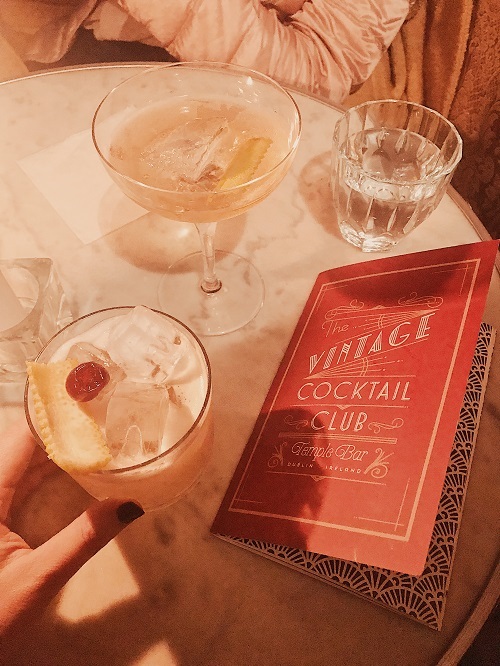 Vintage Cocktail Club in Dublin, Ireland. 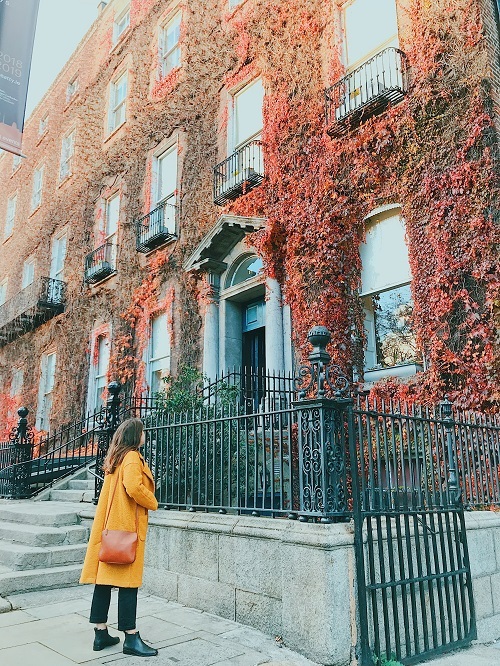 Fall foliage in Dublin, Ireland. 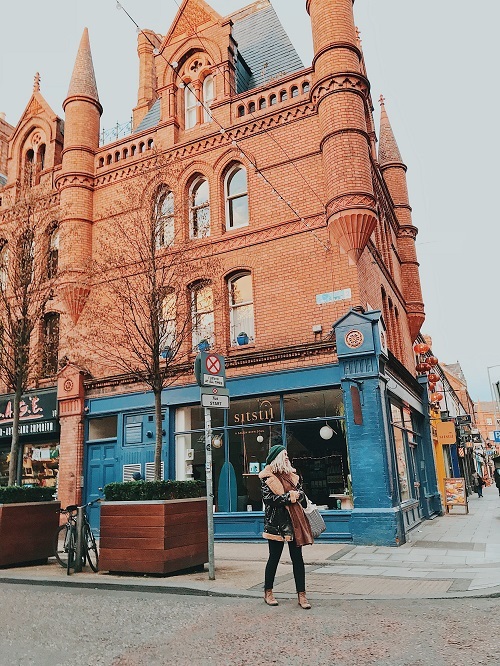 Before our trip, a lot of people said Dublin feels touristy. I’m sure there are parts that do, but overall I loved the city’s vibe. It might have been because we went in the off-season, so it wasn’t quite as crowded and the streets were decorated for Christmas. There were tons of little shops and restaurants to pop into, and we were pleasantly surprised by the quality of food you get for the price. 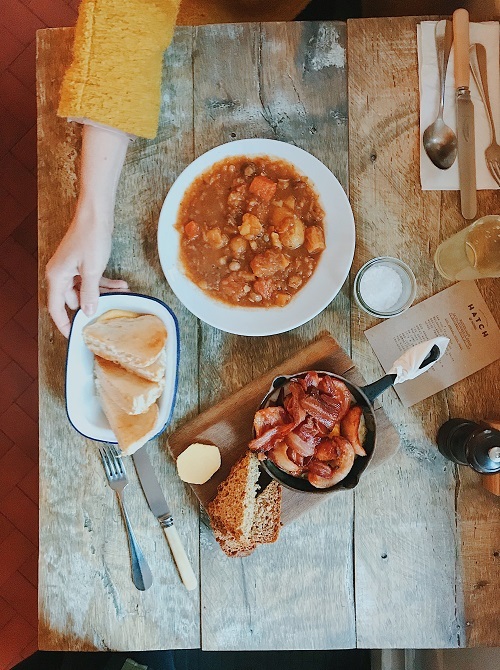 Hatch & Sons for some stew and soda bread with butter. I loved the bread everywhere we went. The Winding Stair for excellent wine, a cozy atmosphere with a view, and delicious food! Fade St. Social for the scallops, truffle fries with bacon, and yummy flatbreads. The restaurant is also on a great street to wander around and find bars off the beaten path. Vintage Cocktail Club. They truly appreciate the art of the cocktail, and the place feels like you have stepped back in time. We went early and didn’t need a reservation. Blind Pig Speakeasy. Does it get old when a bookshelf flies open after pressing a picture? Never. We spent our last night in this cave drinking cocktails and listening to live music by candlelight. Hatch and Sons restaurant in Dublin, Ireland. Stew and soda bread from Hatch and Sons. We tried out two different hotels. The Dean has a very Ace Hotel vibe; it’s hip with cool decor and a great rooftop bar. It is also in a prime location, but the downside is that it’s very loud at night. Dylan Hotel was comfortable and located in a quieter neighborhood, but it was maybe not as “cool” as The Dean. We slept like babies there. On our second day, we made our jetlagged selves wake up early and hit the road. We were nervous about driving on the other side of the road, but it was all good! Rent a small, automatic car. The highways are super easy to drive on, but the smaller streets get very, very narrow. I had to pull in my side mirror at times because the brush would hit the side of the car. You do not want an SUV. Overcommunicate and stay aware. We made sure to speak a lot to get used to driving on the left. Joanie drove and I navigated. There were a lot of roundabouts, which we weren’t used to but they were totally doable! Once you get on a motorway, you are in the clear – and that is two-thirds of the drive. We did a lot of driving in four days, but the scenery was beautiful and we enjoyed listening to podcasts and audiobooks. I wish we had one more day to visit Galway (a lot of people told us to go there but we ran out of time) and maybe Kinsale, too. You could also explore northern Ireland on a longer trip. Doonagore Castle in Doolin, Ireland. 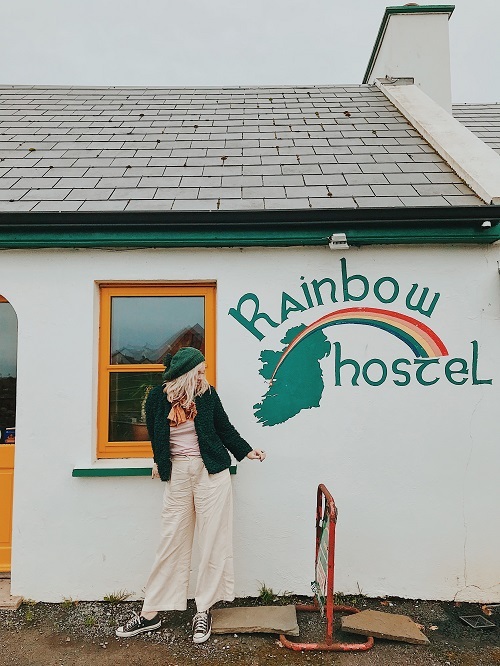 Rainbow Hostel in Doolin, Ireland. 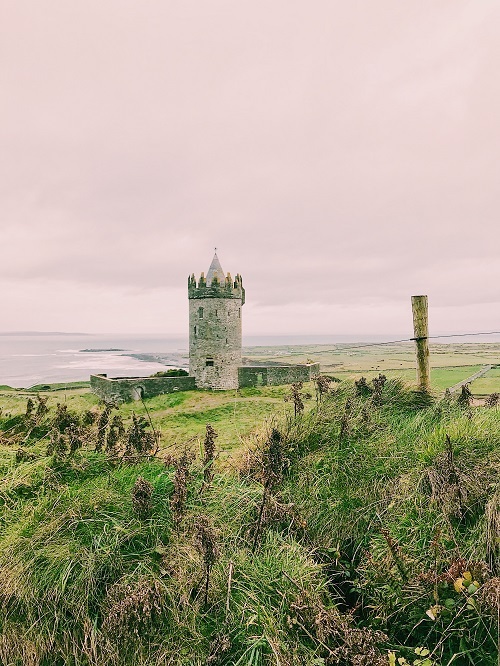 After about a three-hour drive from Dublin, we stopped to explore a little town called Doolin. It’s very small with some cute cottages and only a few pubs. We had a Guinness (loved it in Ireland! ), chowder, and fish and chips by the fire at Gus O’Connor’s Pub. We were content. Fish and chips by the fire at Gus O’Connor’s Pub. 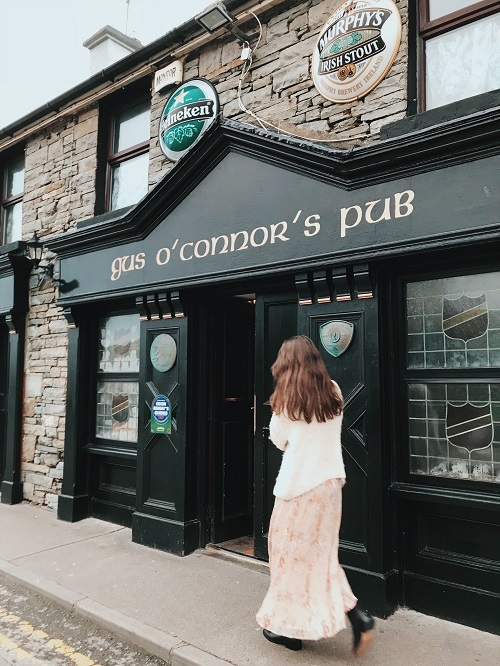 Gus O’Connor’s Pub in Doolin, Ireland. And real estate-lovers: Next door to Gus O’Connor’s is an adorable pink house with a thatched roof! 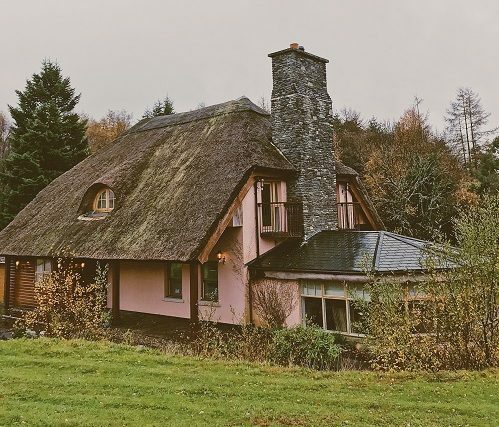 A storybook pink house in Doolin, Ireland. After Doolin, we drove 15 minutes to the Cliffs of Moher. Harry Potter and The Princess Bride were filmed here! They are a magical sight to see. With the fog, it feels quite mysterious and almost spooky. I heard it gets pretty crowded during busy months, but not during the off-season. We just parked at the visitor center across the street, paid 8 Euro each and walked across to the cliffs. We did all of this in about 30 minutes because it started to rain, but people typically walk the cliffs for hours. I would set aside 30 minutes to an hour minimum for the Cliffs of Moher, so you can soak it all in. 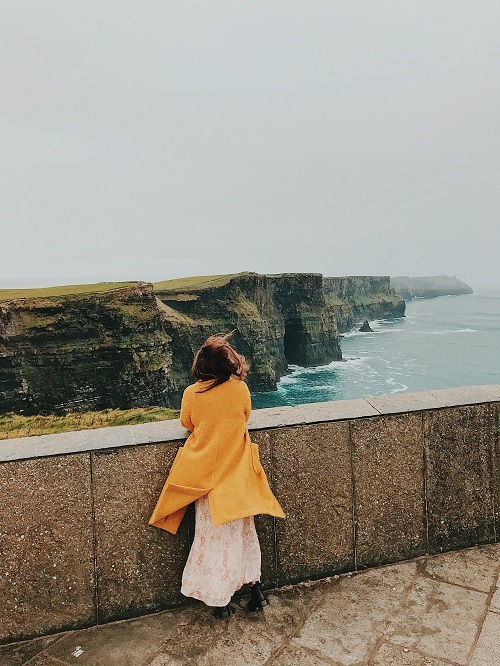 Taking in the Cliffs of Moher. Well, this was quittteeeee the experience. Just outside of Limerick, we arrived at Adare Manor at night as the castle torches sparkled, and a man with a top-hat smiled and directed us in. We walked inside, and instantly felt warm inside – almost like a kid again! We were excited to see what was around each corner. Everything felt authentic and full of charm. Adare Manor, a five-star luxury hotel just outside Limerick, Ireland. Again, we went in the off-season, so we got a nice room with an epic breakfast buffet for 300 Euro. While pricey, it is such a worthwhile stay for a special anniversary or celebration. 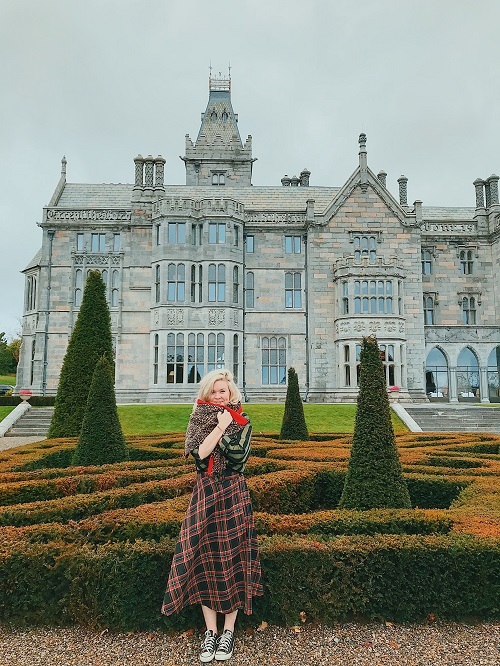 Adare Manor had the friendliest staff, the best dinner of our entire trip, the comfiest beds, a cool bar with interesting cocktails – and we were in a freaking castle! 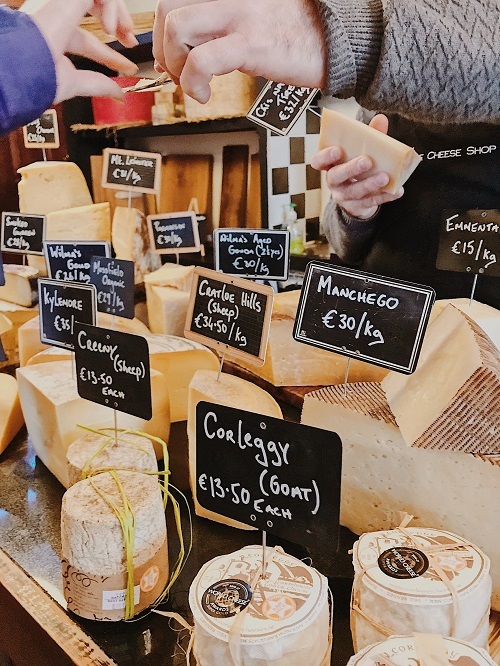 A cheese shop in Dingle. The Bean coffee shop in Dingle. 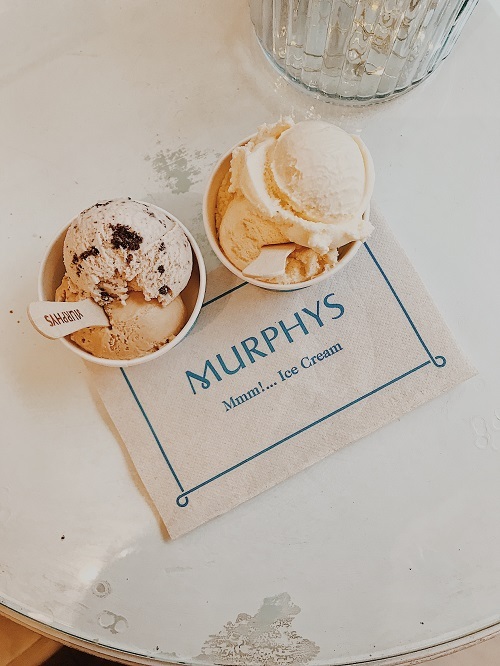 Murphys ice cream is a must when visiting Dingle. 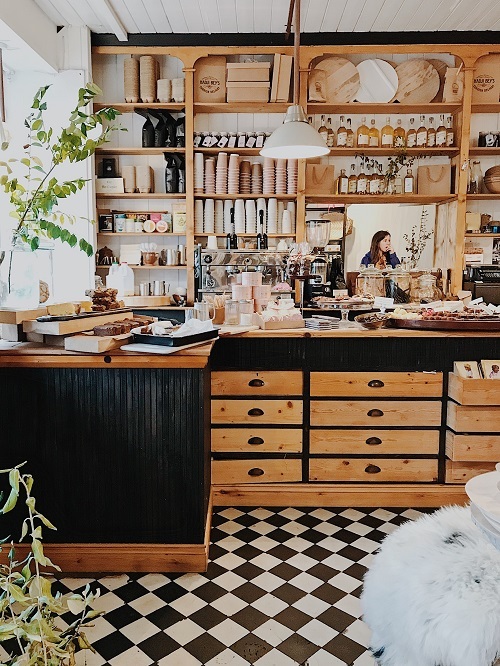 There is no shortage of quaint bakeries and coffee shops in Dingle. The charming town of Dingle, Ireland. 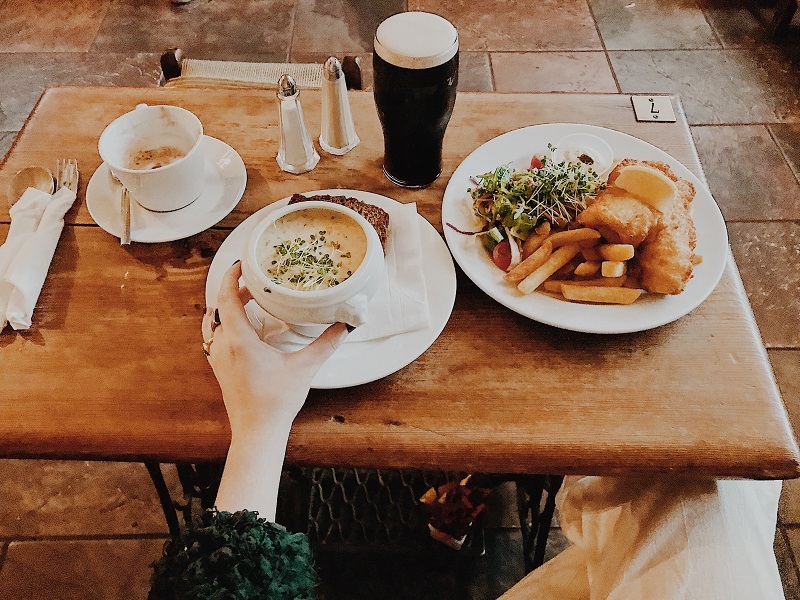 Dingle is the perfect half-day trip. We almost skipped it because we were jetlagged and tired of driving, but we got a coffee and pushed through. 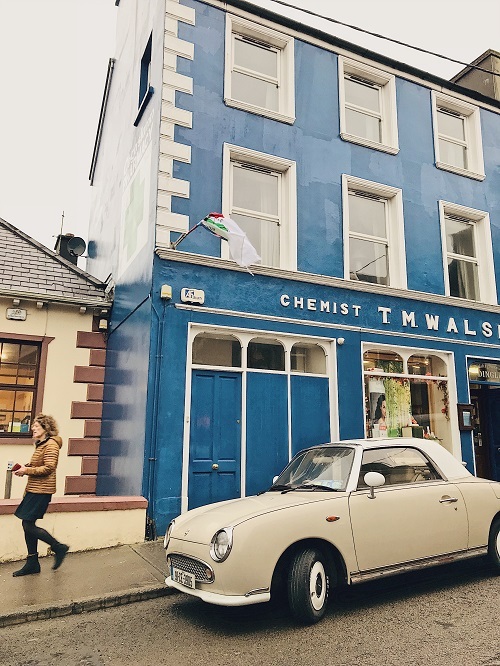 Lots of Instagrammers said we had to visit Dingle, and I’m so happy we did. It’s a very colorful fisherman town on the coast with adorable cheese shops, bakeries, a truck with fish and chips, and fresh seafood in every other restaurant. Coffee at Bean in Dingle. Fish and chips by the water from a takeaway truck. Any pub that suits you! A scenic water view from Sheen Falls Lodge. That night, we drove to our hotel, Sheen Falls Lodge, outside of Killarney. It’s definitely nice – traditional with some modern touches. We had a delicious dinner (tip: get the bacon burger). The rooms were really large, and the property sits next to a little waterfall. It sort of feels like you are in The Shining and it very well might be haunted, but we kind of liked it that way. We recommend staying here, but only if you can get a room for a good price. Get a hot toddy, read a book, and enjoy the misty weather. 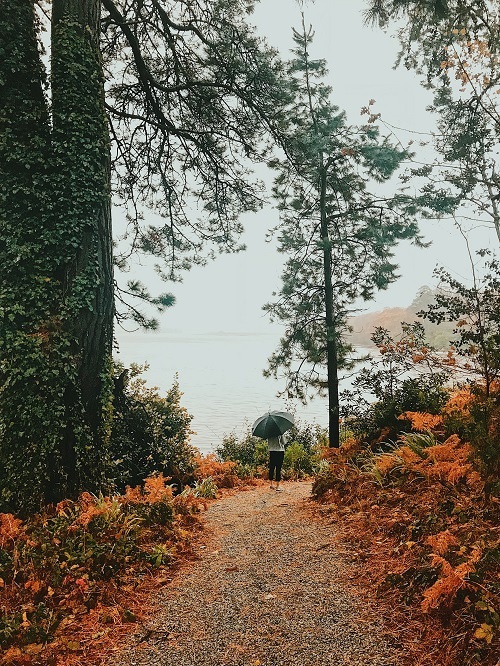 If we had more time, we would have explored Killarney National Park or the town itself, but there is only so much time in a day. We were told by fellow travelers to spend more time in Dingle than Killarney. 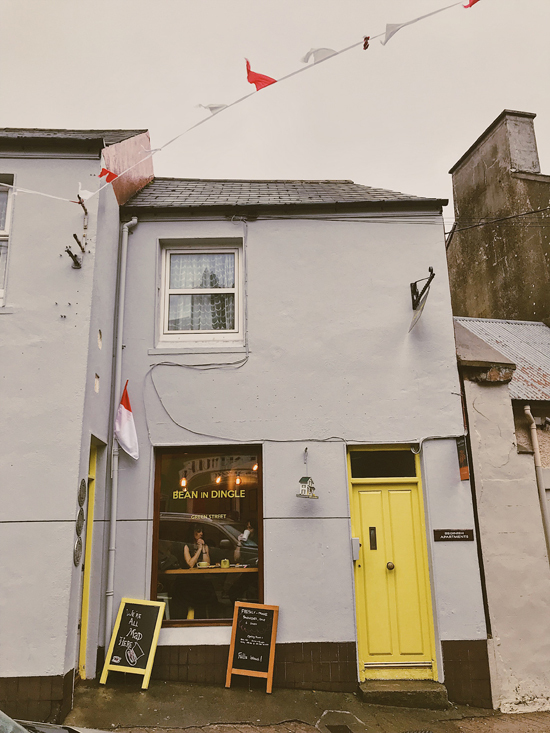 On our last day, we stopped in the town of Cork on our way back to Dublin and saw a secret garden-esque bed-and-breakfast, Ballyvolane House, that looked like a cute place to stay. Hanna’s Femoy with its gourmet cafeteria-style food is a cozy lunch stop before you hit the highway. As I reflect back, it was a whirlwind of a trip, but a very gorgeous one. I definitely want to bring my fiancé back with me someday because it was so rainy and romantic in the off-season. I left feeling inspired by the warmth and kindness of the Irish people. Images courtesy of Bri Emory. Top image taken in Dingle, Ireland. 7 comments on "Castles with charm, cocktails by candlelight: Ireland in the off-season"
Thanks for the info. My son & future daughter in law are thinking of getting married in Ireland (legal in U.S., I understand). first time experience of hearing about WorldlwideWanderer…something to consider. My husband and I love to travel. I never expected to find the love of my life on an Alaska Airlines flight. People meet online instead of in flight these days, right? But just over two years ago, that happened to me. I almost missed my connecting flight in Seattle on my way from Portland to Anchorage due to notorious Portland weather. A man wearing a sweatshirt that read “Kodiak” was also on my flight from Portland to Seattle, and I figured he must also be on his way to Alaska. When we both arrived at the gate for the Anchorage flight in the knick of time, we started chatting. However, he didn’t introduce himself before he suddenly boarded. I found out later that he boarded early as an active member of the U.S. Coast Guard. I thought my chance at getting to know him had vanished. Then, after I boarded, an Alaska Airlines flight attendant delivered a note from the Kodiak stranger. He apologized for not introducing himself and gave me his telephone number. I called when we landed, and we got a quick drink before his next flight to Kodiak. We started seeing each other whenever he was in Anchorage, and I started visiting Kodiak. We agreed to date long distance when he received new orders to Washington, D.C., and I moved back to Portland. Every time he visits me, he flies Alaska, and now we are engaged! I still have the note, scrawled on the back of a Coca Cola polar bear napkin, that the flight attendant delivered. Alaska Airlines brought us together and kept us together. Thank you! What an awesome story, Megan! Thanks for sharing. What a beautiful story ???????????? Being irish born and reared I indeed concur with the many highlights of those journey. I would add the sandy soft white sand of rush beaches. The further deserted strands of donegal. The beautiful Midland soft rolling hills and slow meandering rivers. So much to see. Looking forward to upcoming x mas sojourner repleat with highlight of seeing my 91.5 yr old mam. And no more flights to Mexico City?! Boo!